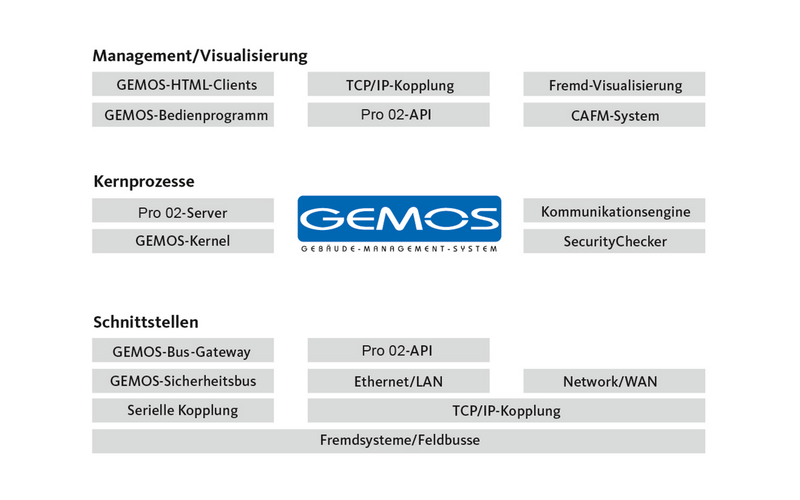 GEMOS is the leading physical security information management system (PSIM) in the German market with over 750 different manufacturer-neutral interfaces and over 1000 installations. The web-based interface makes it possible to design customised user interfaces in accordance with customer needs. Superior availability thanks to various redundancy concepts (network, server, database, etc.). The direct import of CAD drawings in the frequently occurring construction drawing format, allows floor plans to be stored directly as an orientation aid. 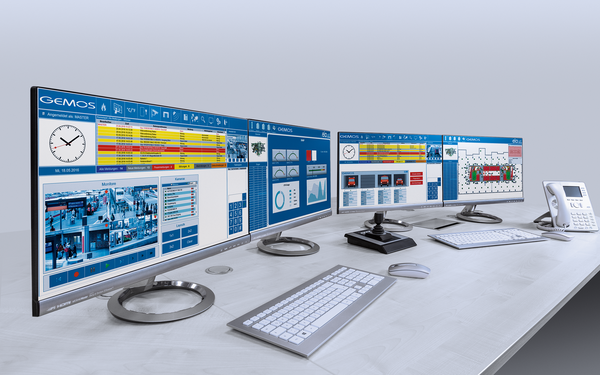 The GEMOS PSIM and organisation system makes it possible to adapt to individual customer user profiles. 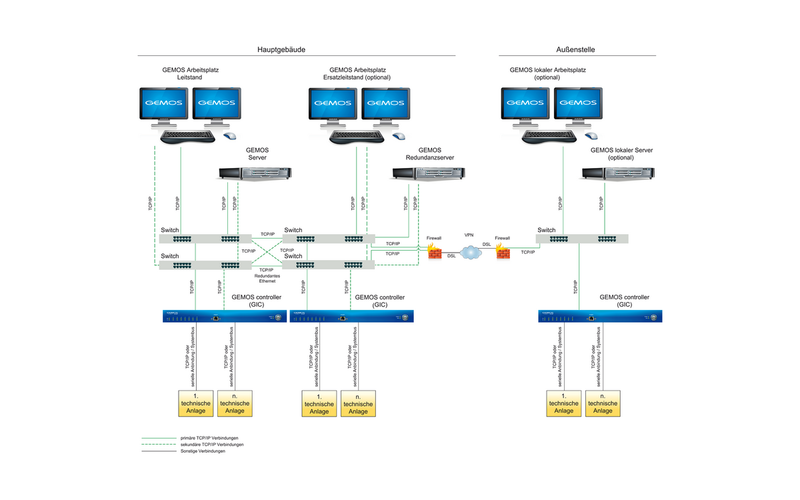 Redundance concepts can be implemented according to workstation, network, server and interface requirements. 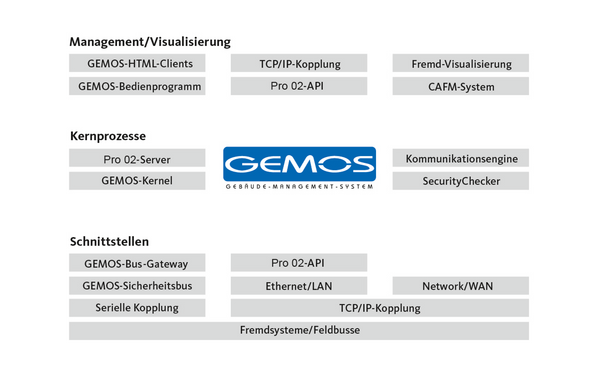 GEMOS can be configured redundantly at all levels. 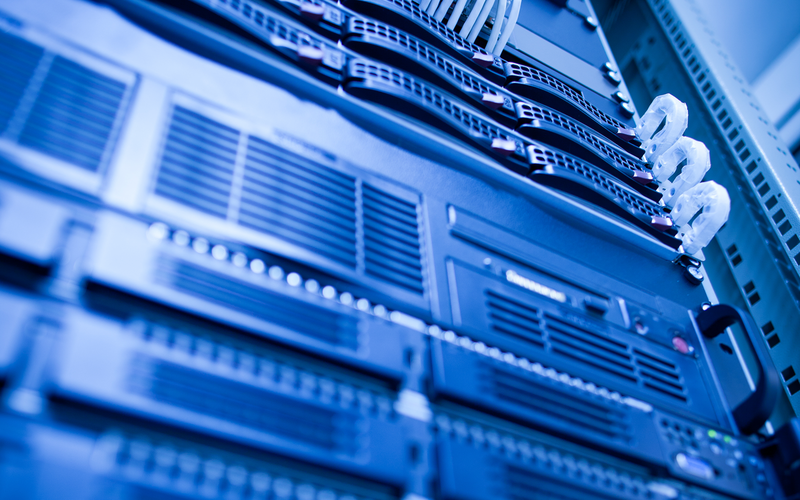 Redundant designs of operating consoles, networks, servers, databases and interfaces absolutely guarantees high availability. The GEMOS HA agent monitors all GEMOS components in that it queries the status via Life Beat. In the case of a malfunction, it informs the hot standby component. which now activates itself as the master and continues its operation. 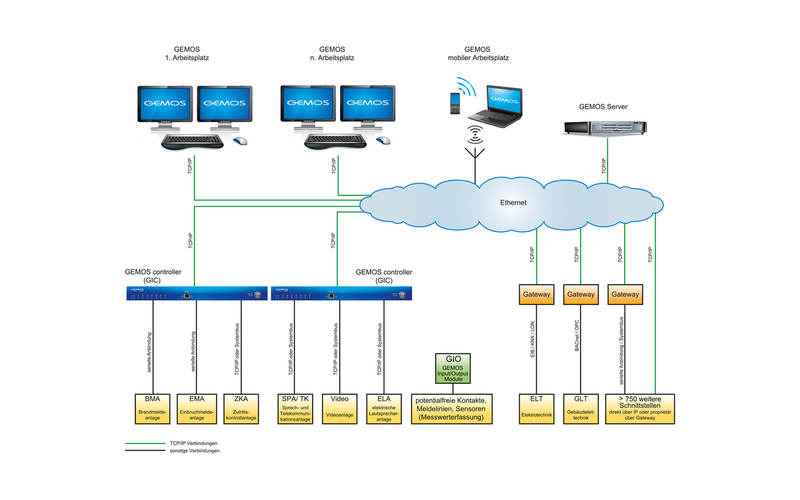 It is possible to manage numerous media, communication and security systems in a manufacturer-neutral manner with GEMOS. The physical link can be made via simple contacts, serial interfaces or TCP/IP. Data connection is effected with native proprietary interfaces or via standard bus systems such as OPC, BACnet, LON or EIB. 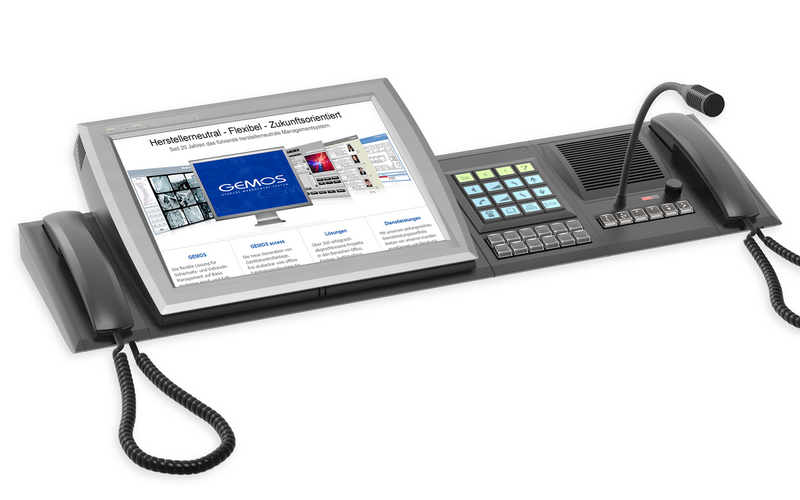 The GEMOS driver is independently run-capable and a self-contained software component that, on the one hand, speaks the language of the third-party trade and, on the other hand, speaks "GEMOS". Thanks to its autonomy, the GEMOS driver can work in offset hardware like in the GEMOS controller under WINDOWS Embedded or Linux. By offsetting on separate hardware, the server can be considerably relieved. If several interfaces are used, these can be separated from each other logically and also spatially. 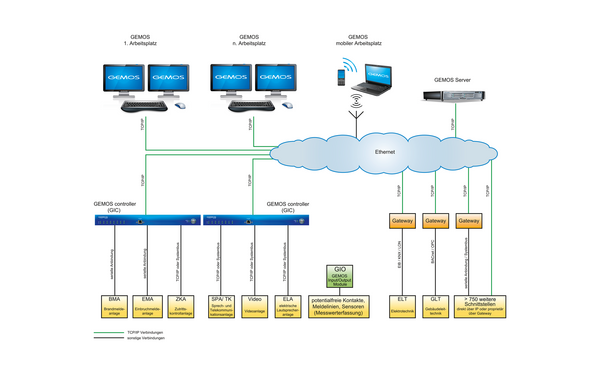 All important hardware parameters are read out and, if necessary, presented as an event in the GEMOS user interface with the GEMOS SNMP status monitor. In the event that the temperature of a hardware component is too high, for example, a pre-defined threshold pre-alarm can be generated so that appropriate measures can be implemented before the affected component fails. Today, the technical equipment in modern sports and multi-purpose arenas must meet the highest demands. In addition to highly available IT and telecommunications structures and high security demands, media equipment like speakers and acoustic irradiation systems, display panels and TV devices are crucial for acceptance with visitors. Modern penal system and forensics place enormous demands on people and technology. The need for protection of employees and officials, as well as occupants and residents living in the vicinity of a penal/forensic facility must be taken into account. 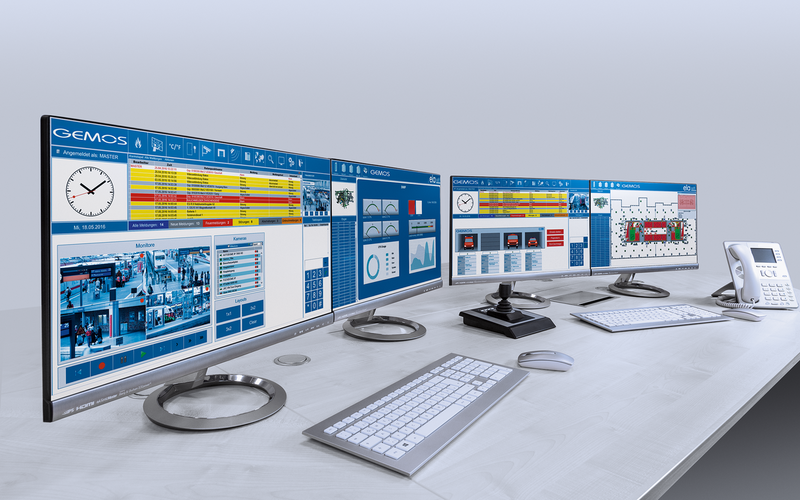 The GEMOS LogisticControl solution is specially tailored to the needs of logistics companies. The module manages all processes, from reception to entry, loading procedures, travel routes, exiting and checkout.